ARISTOCAT BENGAL cattery strives for the look of an exotic wild leopard cat but still keeping the loving, outgoing disposition of a domestic cat. Our cattery specializes in OBEDIENCE TRAINING and our Bengal kittens will know 12-15 commands. Aristocat Bengal is a NC Bengal breeder of exotic Bengal Kittens. Right now we have Bengal kittens for sale that are brown and black rosetted and also Snow Bengal Leopard kittens. We are a responsible, loving, family owned cattery and a member of TICA (The International Cat Association). 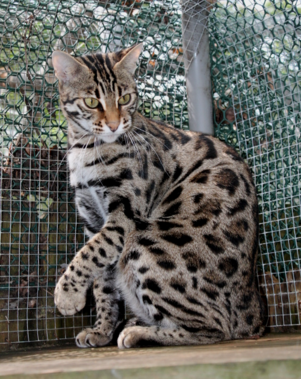 Our Bengal Leopards are the classic brown and black rosetted, clouded rosetted, as well as the beautiful snow and charcoal Bengals. All of our Leopards have ultra soft silky pelts (fur) that are covered with gold glitter. Our Bengal Leopards are BIG! We have some of the largest Bengal kittens you will find. They are more than just Leopards, they are part of our family, and treated like our children. They all have their own rooms for sleeping, but still have free run of the house during the day. WE NEVER CAGE OUR BENGAL ADULTS, OR OUR BENGAL KITTENS! They are trained and socialized from an early age to interact together. When Bengal kittens are born, the mother and father both take part in the raising of their young. As the Bengal kittens get older, they interact with all the Bengals in our home. We work together as a family unit to create a stimulating, loving environment for all our Bengals. Then when you select one of our Bengal kittens for sale, you get the best! Our Bengal Leopards are big, beautiful, confident, intelligent, and cunning. They are also very social, and have outgoing personalities. We are very selective in our breeding program, and we strive to produce Bengal kittens for sale with the best characteristics of the breed, but the exotic look of the wild Asian Leopard. "After dark all cats are leopards"
We strive to breed for size, beauty, health, temperament and intelligence. We work with our Bengals on a daily basis, so when you purchase a kitten for sale from Aristocat Bengal you get the best we can offer. "Where The Bengal is King"
Some of our Bengal Leopards playing in their Enclosure that we custom designed for them. ALL PHOTOGRAPHS ARE THE SOLE PROPERTY OF ARISTOCAT BENGAL CATTERY. WE DO NOT PERMIT OTHER CATTERIES TO POST OUR PHOTOS ON THEIR WEBSITES. The best of the best, our wild Asian Leopard, Queen Nirvana.